Tranquil, clean and cosy hostel run by a Greek family, offering genuine Greek hospitality for backpackers as well as for couples, families and small groups. 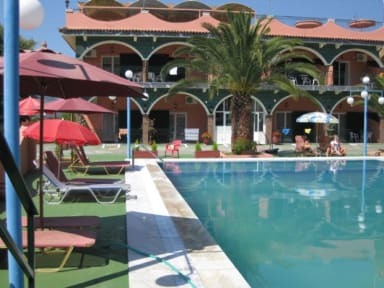 It is an excellent base from where you can explore the beautiful island of Corfu. We are located in the western part of the island, in the beautiful Ropa valley only 12 km from Corfu Town / port & airport and about 3 km way from the famous AQUALAND water park, which is only 3 minutes drive way. Special discounted prices for aqualand water park for all our guests, .Ermones beach is only 35 minutes walk way and the The famous Glyfada beach is at about 7 km distance way and Paleokastritsa , kontoyalos beach and other secluded sandy beaches are also just a short drive way..
All our prices include free Pick up from the airport , studio rooms and dorm rooms are equipped with kitchen, fridge, air-conditioning, private toilette with shower t, as well as private balcony/ patio. If you are looking for a quiet place to get way and relax by the pool, unwind and take a break from busy places, here we are. *Free pickup upon arrival anytime between 08.30 and 22:00 from Corfu port/airport/bus station when booking two nights or more. Arriving by flight we require your flight number, departure airport and actual arrival time. (IMPORTANT NOTICE: Please notify us via e-mail or phone or text us about the time and date of your arrival at least 24 hours beforehand, so we can arrange your pickup) or call us when you arrive at the airport or port. A great place to relax- especially by our poolside bar or swimming pool. We are only a 12 minute drive from Corfu town, port or airport and approximately a 40 minute walk, or short 5 minute drive, to the Ermones beach. We are a 3 minutes drive from the famous Aqualand water park. We are located outside the Agios Ioannis village, in a beautiful valley, is the perfect rural retreat with mountain ranges, fragrant pine forests and valley views. It is the ideal place to relax get away from all the noise and hassles of everyday life. This is also an excellent cycling and walking country, although we recommend you rent a scooter, bike or a car if you wish to explore the island, as we are located in a rural quiet country area. We drive you to the bus stop and also pick you up for free. Within a 10 minute walk there are 2 beautiful Greek Tavernas with authentic Greek cuisine and low prices. We also have a snack bar restaurant on site where we cook home cooked local food, fresh fish,home made pizzas and fresh salads. This is a quiet, peaceful holiday offering an ideal base for both families/ individuals/ friends to explore the island by car, by bike or a scooter or by foot. Thank you so much Magdalena! I initially booked for a few days, then ended up staying a whole month! :) Magdalena has such a welcoming family! Since I’ve started my travels this was the best hostel by far, staff are amazing! They showed us some incredible places and pristine beaches! By the end of the trip I felt like one of the family and one of the locals. See you all again next year :) I miss your homely dinners already! We stayed 4 nights in double bed room. The staff is very nice and if needed Madga speaks many languages. The pick-up and drop to/from airport or port is very helpful. There a kitchen (fridge, gas, sink, ...)in our room which was super. You have to rent a transport to visit Corfu. You can rent scooter (the cheapest and most fun option) directly at the hostel. Villa Madalena is perfect for families and backpackers who want unique accomodation with a soul. The perfect antidote to the party hostel scene or generic hotel. I shared great conversations with lovely people from a variety of countries while enjoying the warm hospitality and delicious food offered by Magdalena, her lovely family, Alison and the other staff. Magda collected me from the port and I found clean, comfortable rooms, a good shower and a beautiful pool. I stayed here for just one night but wished I could have stayed for more. The nicest friendliest staff, big continental breakfast, beautiful pool to cool off in, kittens to pet and large quiet rooms. The best thing about this place is the family who run it. Madalena with her flawless English will help you with travel plans and give you advice or lifts, you will be made to feel at home and you won't want to leave! 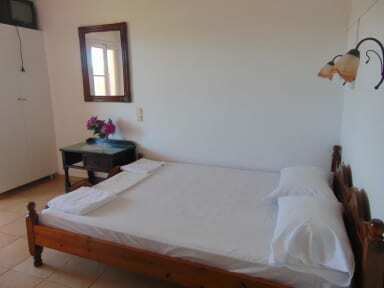 Magdalena's backpacker is a wonderful place to stay at while visiting Corfu. The facilities and the outdoor area with a huge swimming pool are great. It's a bit on the outside but there are bikes available and the hostel's staff offers pick-ups and lifts wherever you need to go in the area for a really good price. I would definitely stay there again! The staff is great and the rooms are really nice and cheap! There's a nice pool, and you can buy food there and cook yourself. Its far away from corfu but you can bike to some very nice beaches. The atmosphere is'nt amazing, and there's wasn't a lot of young people to talk with. It's a perfect hostel if you want a break from partyhostels and wan't to relax. Magdalena and her Family were very welcoming and provided any assistance they could. She picked me up from the airport and dropped me at the port as there were no buses running in the area. Her family made a lovely meal and there were even kittens to cuddle. I would love to stay the next time I am in Corfu! Happy to organise pick up to and from the airport even at 'unreasonable' hours. Magdalena was lovely and would always go above and beyond to help you. The private room we had was beautiful, with air con. Facilities work great. A little far fro town but staff are willing to help with car and/or bike hire. This is for the pink palace as I got moved there without management notifying me until I inquired.. She said she will put me up in a better room which upon arrival it was just like any other room. Paid for a double room which is honestly not worth it. There is no wifi first of all. The rooms are very basic and the walls are so thin that you can hear everything next door or outside has to offer. Would not stay here again.